We’ve got some good news and then we’ve got some bad news. The Good: The Kladder House now has central air conditioning and as a result I’ve become a nicer person! You think I’m kidding – you try putting on skinny jeans in a house without AC. It’ll get to you after a few sweaty attempts. The Bad: I have a stress fracture in my right heel after jumping into the shallow end of a pool. I have no one to blame but my own self and I totally regret it. I’ve got this cool new boot that’s making things slower, harder and less fun. However, I will prevail! This week Jeff and I took the kids for a spin around Reeds Lake on our bikes (without my cool boot – I just taped it up really tight in my tennis shoe) and I was able to pedal without pain. Discovering this has me feeling hopeful after a few weeks of watching the fun from our couch. I might not be up to power walking status just yet but the ability to pedal means I might be ready to get back to spin class. Despite my bum foot, we’ve still fit plenty of fun into the last two weeks including a weekend of camping. 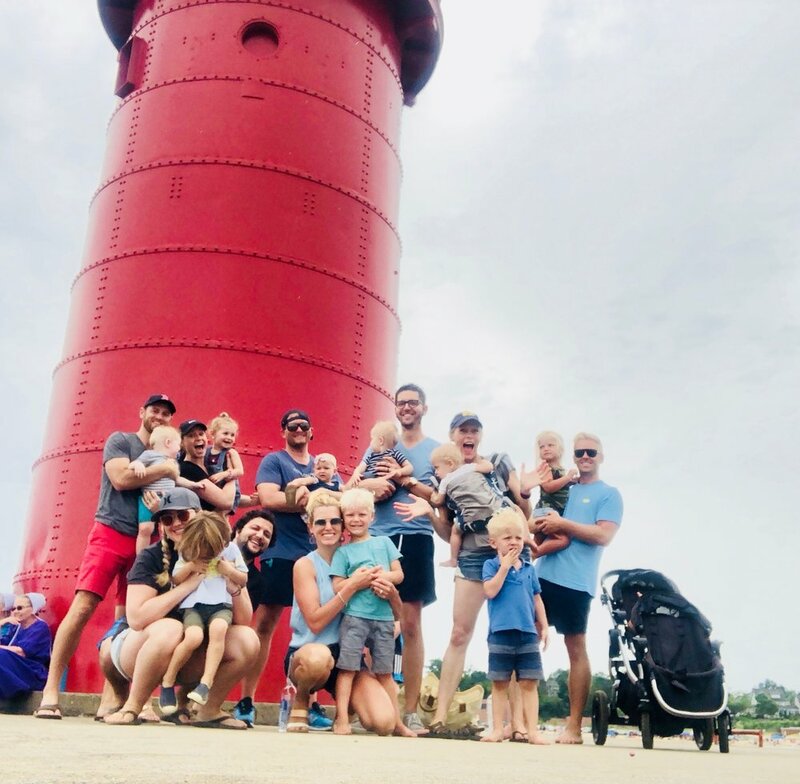 Last Friday we packed up the car and headed to South Haven, Michigan with our house church group - 10 adults and 12 kids total. We rented cabins at Yogi Bears Jellystone Camp Ground which turned out to be quite glamorous including AC, microwaves, mini fridges and some cabins even had their own bathrooms. 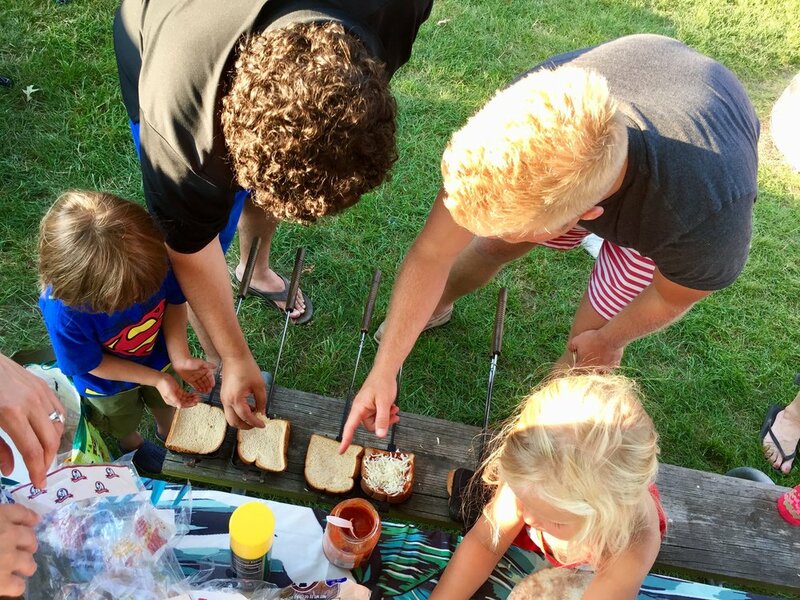 We built campfires, made hobo pies, roasted s'mores, played yard games, swam, went for a wagon ride around the park and because it was 'Chocolate Week' at the campground some of the kids even did a chocolate slip n' slide. Thankfully Natalie hates being messy and opted for the playground instead. I can't say Thomas would have made the same decision had he been given the chance. That Saturday we packed up the crew and headed into downtown South Haven to walk the pier and see the lighthouse. I hobbled along with my foot because sitting on a park bench waiting for everyone to return sounded boring. I survived. We later rewarded ourselves with ice cream at Sherman's Dairy Bar. Compared to our usual Hudsonville hand dipped cone at Jersey Junction, Sherman's was super creamy and almost gooey. 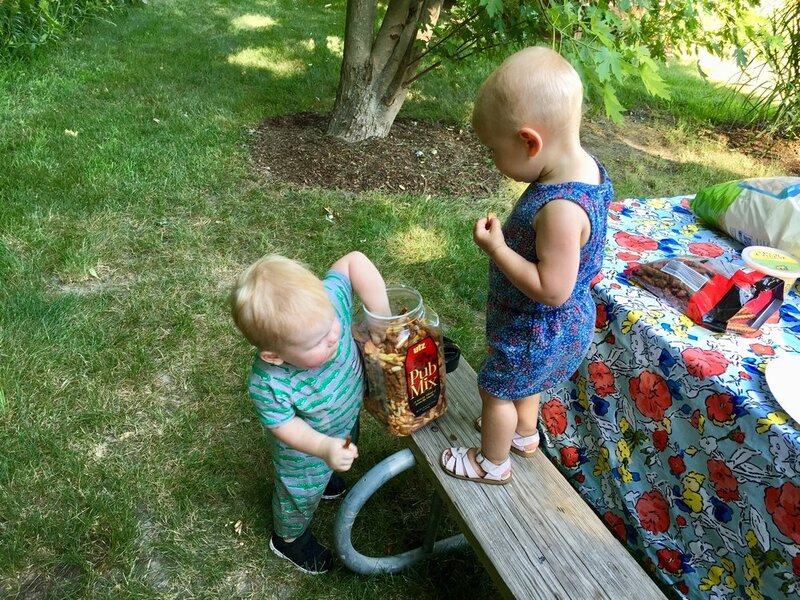 They had a ton of flavors to chose from and the kids all loved it. 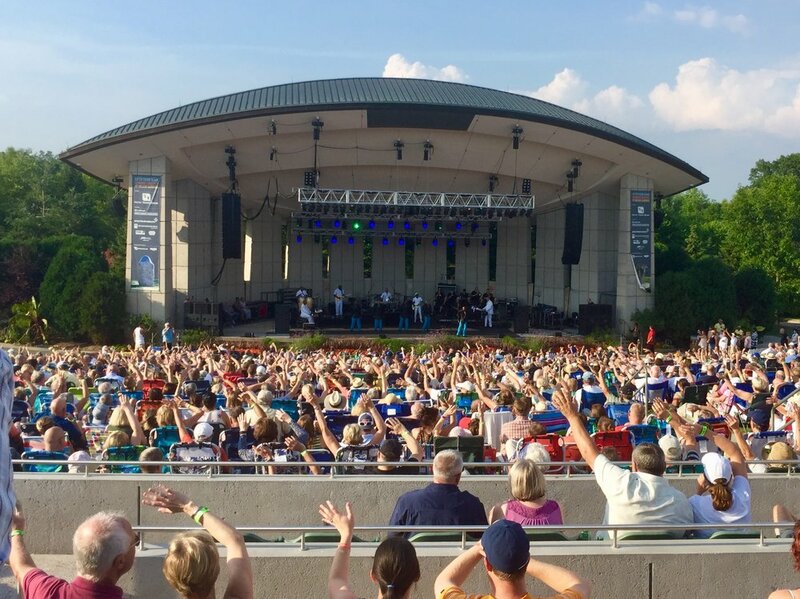 We returned Sunday just in time to unpack and head back out with friends to see The Temptations and The Four Tops at Fredrick Meijer Gardens. It was the perfect night for an outdoor concert and the show was excellent! They all had matching sequined suits, choreographed dance moves and a full supporting jazz band. It was probably one of the best performances we've seen at FMGs. Alternatively, this past Monday we found ourselves back at FMGs for Dispatch and the weather was anything but perfect. We got absolutely drenched! And for completely different reasons than the week before, it too made the list as one of the best shows we've seen at the Gardens. We all reached the point of not caring about the rain anymore finding ourselves fully immersed in the experience. It was glorious! The kids are doing great. Thomas has now reached the age where he's quick enough to at least tag along with Natalie as she floats from place to place. It's not uncommon these days for Jeff and me to find ourselves sitting quietly in the living room and realize the kids have gone upstairs to play alone together. The other day Thomas said, 'doggy' which was a first and I was pumped! Never mind that he was referring to a horse. 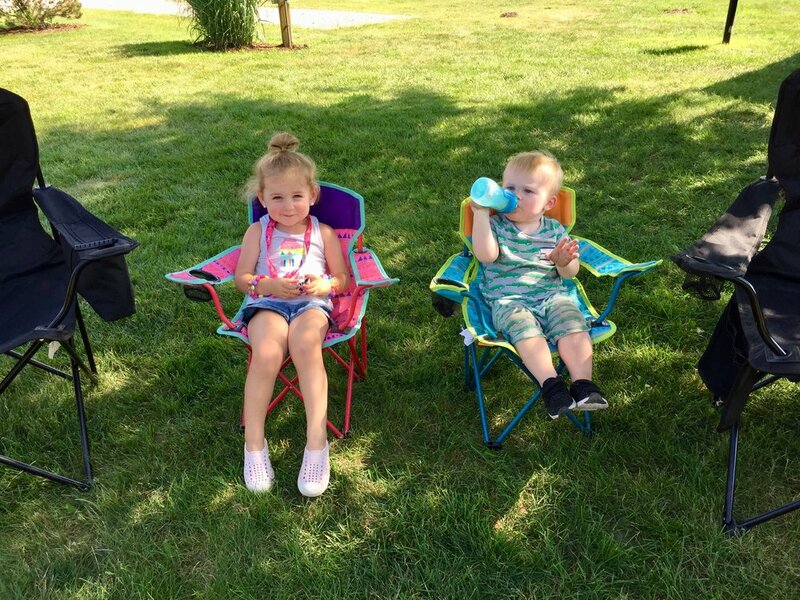 Natalie is very excited to start preschool this Fall and asks about it almost daily. She's still hard to convince to wear anything but dresses and last week she told me that she is, "going to change the world." So confidence isn't really an issue with her. Last weekend we partied out at Watermark for the annual Mens Member-Member Tournament. While Jeff and his partner didn't score well, two of our very good friends Nate and Marcus came in second overall which made more a fun night of celebration. 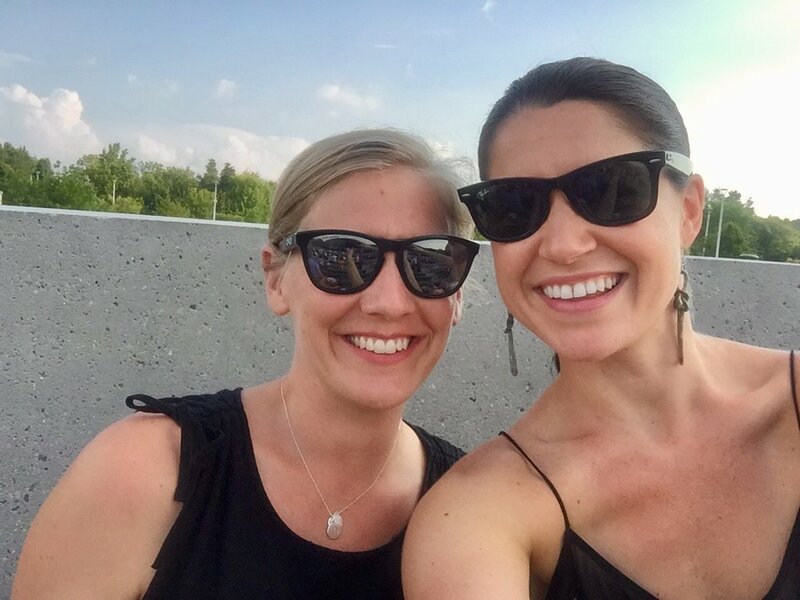 This year the Womens Association Board hosted an afternoon ladies happy hour which was a fun addition to the weekend of festivities. Summer is flying by and this boot isn't helping! Hoping to get off the sidelines and back in the game next month as we look forward to spending time with family up north and a trip out to the West Coast just the two of us. Enjoy the rest of your July and see you in August! The Dailey Method is offering a FREE Planks in the Park class on August 1st. If you've been wanting to see what they're all about this is a good sneak peek. Sign up HERE.